Having grown up a military brat, I was no stranger to living overseas. After working for corporations for over 30 years, when retirement came around my wife Mary and I had become unhappy with the way things were going in the U.S. So we decided to find somewhere else to retire to. We made a list of 15 countries including some in Europe, Latin America, Australia and New Zealand, and Asia. We spent a year doing research, eventually settling on Ecuador. We took a couple of scouting trips and finally moved to Quito in February 2015. It had everything we wanted… Healthcare is very good and our experience to date has confirmed our original judgement. The weather is very temperate, we no longer wanted to deal with the extreme weather conditions. We have a new international airport and Ecuador is welcoming to expats. The immigration process is simple and straightforward. Also, the culture is inviting and the people are friendly. 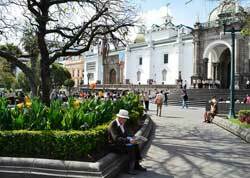 Quito is a city of about 2.5 million people. Old Town is a UNESCO Heritage Site with lots of ornate churches and plenty of land dedicated to city parks, so it’s a very green city. Wayne’s new life in Quito allows him take control over the lifestyle he wants to lead. Your cost of living here really depends on your lifestyle. It’s possible to live comfortably on as little as a $1,000 a month and we know many people who do. When we moved here we were pleasantly surprised by how much things cost. Our monthly budget is about $1,000 not including rent. Our rent is $1,400 a month but our apartment is over 3,000 square feet, which is larger than most of our friends. Many expats we know rent apartments for between $600 and $1,000 a month. 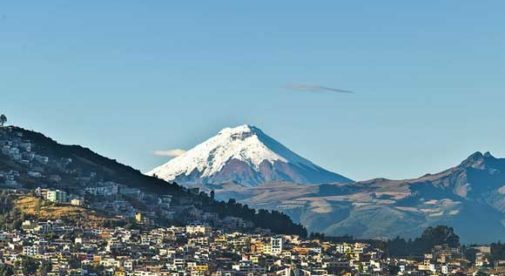 You can rent in Quito for anywhere from $400 to $2,000, and you can buy for anywhere from $40,000 to $600,000 or higher. Because the weather in Quito is about 70 F all year round, we generally don’t need heat or air conditioning so those bills are virtually non-existent. In the U.S. we had a landline and two cell phones that cost us around $200 a month…here we get a landline for $7 and our monthly cell phone bill averages about $15. The cost of eating out in Quito is also inexpensive. A tasty lunch runs $3 to $5 and a nice dinner $8 to $12. Of course, as the country’s capital there are some high-end restaurants too but even in those a couple can eat for about $50 to $60 including a glass of wine. Our basic food costs are 15% to 20% of what we used to pay in the U.S. The healthcare is very good here. My wife and I are healthy so we’ve rarely had to use the healthcare facilities, but when we did have to see a doctor it was a pleasant and satisfying experience. Health insurance, like many countries, has some limitations but my wife and I were able to get insurance for $350 a month (and it’s a policy that covers us around the world, not just in Ecuador). In the U.S. we used to pay $1,000 a month. Back in the U.S. we led a suburban lifestyle, but here in Quito we live an urban life. We don’t own a car as taxis are plentiful and we can get anywhere in the city for between $1.50 and $4. Our days are pretty relaxing. We read a lot, and love to walk around the city and explore and experience new things…we went to a creme brulee tasting recently at 10 a.m. We often meet friends for coffee and spend Sundays in one park or another. Having been in Quito for over a year now, we look back on our life in the U.S. and it seems so “coddled.” The government provides so many services you want for very little, but it’s also beginning to feel as if they can also direct how you live your life. Here in Ecuador, you live a life integrated with your neighbors and there are no rules regarding your lifestyle.